Have you ever spent time on your phone or computer and wondered where the last 2 hours had gone? Not in the wonderful, 'I'm doing something I'm passionate about so I lost track of time" way, but in the, "Oh crap what did I just do for 2 hours" way. I know I've done that...and felt pretty crappy afterward. Do you often feel like there is ALWAYS 107 more things on your to-do list and that you will never get them all done and never be enough? This also happens to me more than I'd like to admit. That's why I am spending time writing today about the importance of slowing down. Like WAAAY down. I have good news and I have bad news. The Good News: You aren't alone...feeling like you always need to hustle for more is a wide spread feeling. The Bad News: You aren't alone...our society is relentless in its quest to make us feel like we are never enough. It encourages us to push for more and more until we feel so exhausted that we might break. We are taught to never be satisfied and always be in search for more. My partner and I have been having more and more conversations about the importance of slowing down and not expecting us to be masters of all. The way we like to think about it is with an analogy. Imagine that you are a car...whatever kind of beautiful car you want to be. So, our society tells us that we need tasks and goals and stimulation and that we should always be living at 80 miles per hour. But life isn't always going to be glam and exciting, so we drop down to 20 miles per hour when we have to do things we don't want to do. We are constantly revving the engine up to 80 to please our hustle society and then dropping back to 20 when life isn't perfect. This is tough on our engine! Revving it all the way up to 80 all the time (or worse, never taking your foot off the gas and staying at 80 all the time) is going to wear us down...fast. Instead, I have begun to aim to live life at a solid 40. I don't want to feel like I have to rev my engine to keep up, and then feel sad when my life isn't as glitzy as everyone promised it would be and I drop back down to 20. Slow and steady wins the race. I want to feel content, fulfilled, and happy at a solid 40...which means learning to release the constant harmful hustle and live slow. The more we talked about living slowly, the more compelled I was to learn more about it. Happily, there is actually a huge movement out there about living life more slowly. It's about learning to appreciate and connect with where you are in each moment, to spend time with those you love, and to release the pressures that society puts on us to be perfect and just be ourselves. It's absolutely beautiful. There are some of the amazing individuals creating advocacy for this movement, but my first exposure to it was through Brooke McAllary's Slow Your Home Podcast. If you want to dip your toes in the idea, this podcast is a great place to start. Brooke interviews loads of other slow living advocates and gives you great ideas about how to integrate slow into even the busiest lives. There are so many amazing benefits to slowing down your life. By slowing down, you can learn to appreciate what you have, to connect with the space you live in and the people you interact with, and to learn what really brings you happiness and fulfillment in life. You deserve to have the time to do things you are crazy passionate about. You can't be your best self until you realize what really matters to you and spend your time focusing on those things...and I can tell you right now that what truly matters is not money. Here's a little truth bomb for you: Working crazy long hours doesn't make you a more valuable human. In reality, it spreads you out so thin that you are doing even the things you are passionate about with less gusto than they deserve, let alone the things you feel obligated to do. By pushing yourself too hard and living a life that is way too fast, you end up blinking life by and not feeling fulfilled in the slightest. 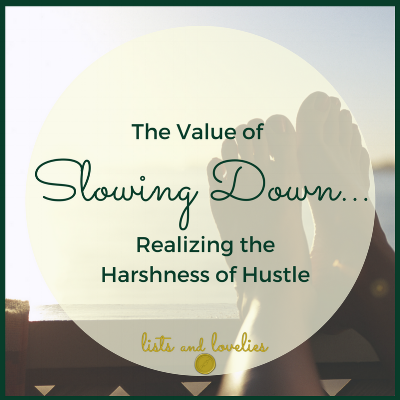 Slowness brings a level of sanity that most of us have never experienced before. You ARE enough. Right now. Right here. No matter how inadequate society has made you feel and no matter how much more you think you have to go before you can be happy. The truth is, you can be happy right now...it just takes a little slow living and a lot of realizing what really matters. Life doesn't have to be a big ball of stress...slow living is about learning to enjoy life more. To not race through it in such a blur that you miss out on appreciating the good stuff until it is too late. You don't have to be perfect. You don't have to be a millionaire. Those things really don't matter in the long run. You just need to be you, stop and smell the roses, and learn to love life right now. So what truly matters to you? I encourage you to think about this, take a chance to learn more about slow living and see if it is a good fit for you. If you need a little help, check out my Slow Living Evaluation: Releasing Hustle Tendencies worksheet to get started. And as always, I would love to hear how you are learning to live slow and be enough in the comments! All images included are not mine. Each will lead you to the original website or pin when you click on them. Enjoy their beauty!